Are we getting access to information? Can we cope with a diversity of views? What is the role of public institutions like our Library? Who are they supposed to serve and how? How do we ensure that our personal values also have a space in secular Singapore? 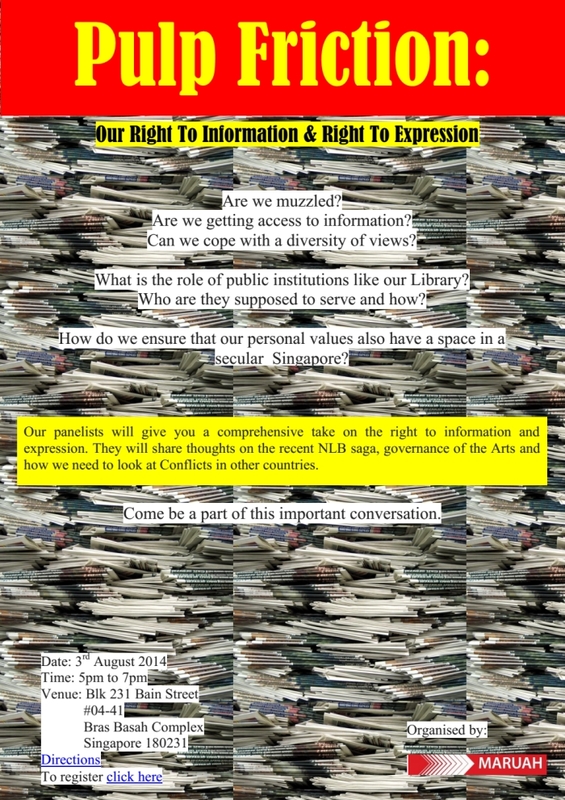 Our panelists will give you a comprehensive take on the right to information and expression. They will share thoughts on the recent NLB saga, governance of the Arts and how we need to look at Conflicts in other countries. Come and be a part of this important conversation. This entry was posted on Sunday, July 20th, 2014 at 11:30 pm and is filed under Events. You can follow any responses to this entry through the RSS 2.0 feed. You can leave a response, or trackback from your own site.